Partly cloudy skies. High 84F. Winds W at 5 to 10 mph.. Widely scattered showers or a thunderstorm early. Then partly cloudy. Low 57F. Winds light and variable. Chance of rain 30%. 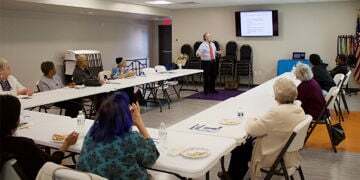 Dr. H. Eddie Akbari discusses colon cancer prevention at a YMCA Lunch & Learn. olon cancer is cancer of the large intestine, the lower part of the digestive system. Most cases begin silently, as a polyp that causes few symptoms. Akbari stressed that Colon Cancer can be prevented. Cancer of the colon is the third most common cancer in the United States – and, caught early, it’s also one of the most curable. About 90 percent of individuals whose cancer is found before it has spread survive five years after diagnosis. But, if not caught at this point, the five-year survival rate is just 10 percent. For residents in and around Emporia, colon cancer rates are even more alarming. According to a study in Cancer Epidemiology, Biomarkers & Prevention, a journal of the American Association for Cancer Research, eastern Virginia and North Carolina are one of 3 hot spots for increased death from colon cancer. Colon cancer is cancer of the large intestine, the lower part of the digestive system. Most cases begin silently, as a polyp that causes few symptoms. At a recent talk to Dr. Akbari stressed that Colon Cancer can be prevented. Akbari says there are five simple steps that you can take to protect your health. In 2018, the American Cancer Society (ACS) issued new screening guidelines for all adults over age 45 to begin routine colon cancer screenings. Prevention is the primary goal and steer providers and patients toward those tests with the highest potential to prevent cancer. The recommendations include two tests and more specifically define the differences between tests: those that find cancer, and those that can find precancerous growths (also known as polyps). ACS recommends those tests that actually examine the interior of the colon because they cannot only detect cancer, but also prevent it by finding – and removing – polyps or growths that can potentially cause cancer. These tests include a flexible signoidoscopy (every five years); a colonoscopy (every 10 years); a double contrast barium enema (every five years); or a CT colonography or virtual colonoscopy (every five years). Polyps found during these tests can be removed on the spot, simply and painlessly. Be vigilant about scheduled screenings, and if you have certain symptoms, see your doctor sooner. Symptoms may include persistent stomach discomfort, a change in bowel habits (diarrhea, constipation, or a change in stool consistency), abdominal pain accompanying a bowel movement, dark stools, weakness or fatigue, unexplained weight loss, or blood in the stool. Symptoms vary, and certain foods or medications can also mimic these symptoms. It’s best to err on the safe side and check with your doctor about changes. A balanced diet, regular exercise and smart lifestyle choices will keep your risk level in check. A diet rich in fruits, vegetables and whole grains provides the nutrients and antioxidants that fight disease. Low-fat dairy products and limited consumption of red meat keep your saturated fat intake low. Getting your vitamins and minerals through a daily supplement helps, but food-based vitamins are more effective and more easily absorbed by the body. Regular exercise – at least 30 minutes most days of the week – helps build your body’s defenses. Finally, quitting smoking and limiting alcohol consumption help, too. Talk with your doctor about the best way to manage your risk. If you have an above-average risk for colon cancer or an initial test reveals polyps, you and your doctor can decide the course of action that works best for you. Talk with your doctor at Southern Virginia Regional Medical Center about the resources available to you and learn the best way to manage your risk. Board certified in colorectal and general surgery, Akbari, MD, PhD, FACS, specializes in colon, rectal and anorectal surgery. He earned his medical degree from the University of Medicine and Dentistry of New Jersey, completed a fellowship at St. Luke’s Roosevelt Hospital Center and his residencies at Georgetown University Medical Center and the University of Toronto. To make an appointment or a referral, please call (804) 520-6730.